Aborkin A.V., Zaharov A.A., Babin D.M., Orekhov O.P. The paper deals with the issues of determining the effect of process parameters (such as rotor speed and friction coefficient) on the power parameters of the continuous channel-angular pressing of aluminum. The technique to carry out the experiment has been developed. Experimental data on changes in power parameters of the continuous channel-angular pressing of aluminum has been received. A simulation model for qualitative and quantitative process of the continuous channel-angular pressing of AD0 aluminum alloy has been developed and presented in numbers. The simulation model has been tested for its accuracy by comparing the calculated and experimental data. The estimation of process parameters effect on power parameters of the continuous channel-angular pressing has been obtained. The calculations have proved that increasing the rotor speed can result in 7% increase in the torque value and 20% friction coefficient increase. Keywords: continuous channel-angular pressing, intensive plastic deformation, power parameters. 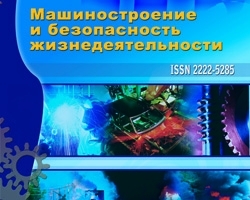 Aborkin A.V., Babin D.M., Calculation and experimental study of power parameters of the continuous channel-angular pressing of aluminum, №3 (17) 2013, Orekhov O.P., Zaharov A.A.